Farrell et al. 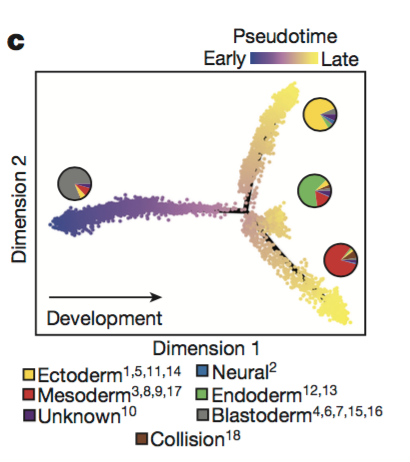 Single-cell reconstruction of developmental trajectories during zebrafish embryogenesis. Science (2018). During embryogenesis, cells acquire distinct fates by transitioning through transcriptional states. To uncover these transcriptional trajectories during zebrafish embryogenesis, we sequenced 38,731 cells and developed URD, a simulated diffusion-based computational reconstruction method. URD identified the trajectories of 25 cell types through early somitogenesis, gene expression along them, and their spatial origin in the blastula. Analysis of Nodal signaling mutants revealed that their transcriptomes were canalized into a subset of wild-type transcriptional trajectories. Some wild-type developmental branchpoints contained cells expressing genes characteristic of multiple fates. These cells appeared to trans-specify from one fate to another. 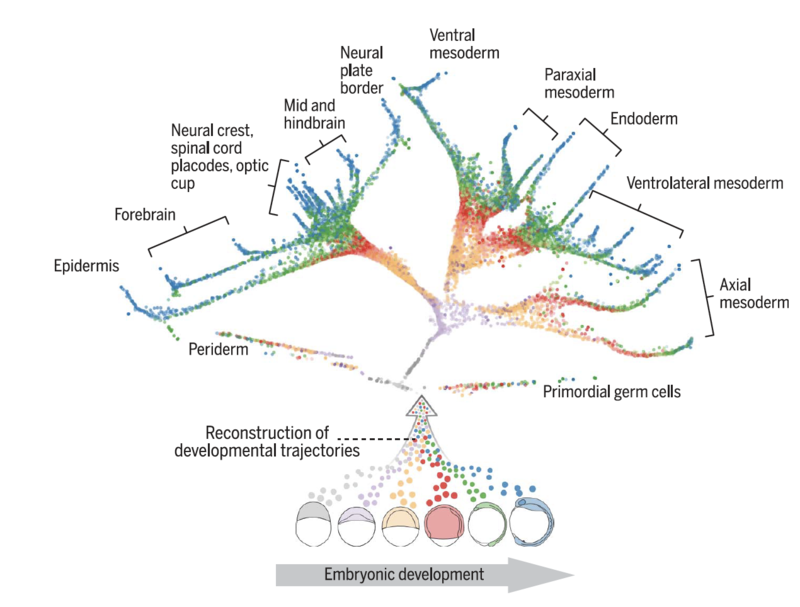 These findings reconstruct the transcriptional trajectories of a vertebrate embryo, highlight the concurrent canalization and plasticity of embryonic specification, and provide a framework to reconstruct complex developmental trees from single-cell transcriptomes. Shah et al. Dynamics and Spatial Genomics of the Nascent Transcriptome by Intron seqFISH. Cell (2018). Visualization of the transcriptome and the nuclear organization in situ has been challenging for single-cell analysis. Here, we demonstrate a multiplexed single-molecule in situ method, intron seqFISH, that allows imaging of 10,421 genes at their nascent transcription active sites in single cells, followed by mRNA and lncRNA seqFISH and immunofluorescence. This nascent transcriptome-profiling method can identify different cell types and states with mouse embryonic stem cells and fibroblasts. The nascent sites of RNA synthesis tend to be localized on the surfaces of chromosome territories, and their organization in individual cells is highly variable. Surprisingly, the global nascent transcription oscillated asynchronously in individual cells with a period of 2 hr in mouse embryonic stem cells, as well as in fibroblasts. Together, spatial genomics of the nascent transcriptome by intron seqFISH reveals nuclear organizational principles and fast dynamics in single cells that are otherwise obscured. Raj et al. 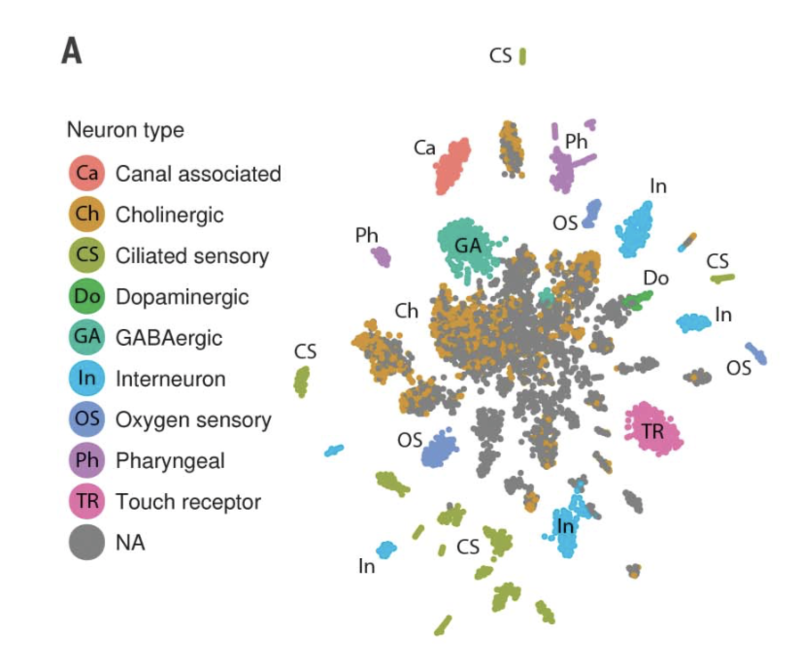 Simultaneous single-cell profiling of lineages and cell types in the vertebrate brain. Nature Biotechnology (2018). 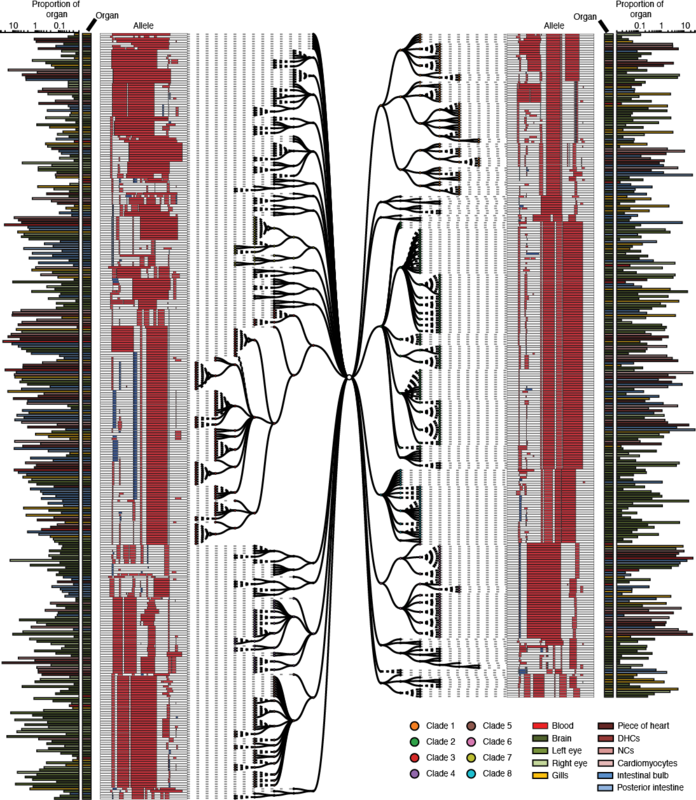 The lineage relationships among the hundreds of cell types generated during development are difficult to reconstruct. A recent method, GESTALT, used CRISPR-Cas9 barcode editing for large-scale lineage tracing, but was restricted to early development and did not identify cell types. Here we present scGESTALT, which combines the lineage recording capabilities of GESTALT with cell-type identification by single-cell RNA sequencing. The method relies on an inducible system that enables barcodes to be edited at multiple time points, capturing lineage information from later stages of development. Sequencing of ∼60,000 transcriptomes from the juvenile zebrafish brain identified >100 cell types and marker genes. Using these data, we generate lineage trees with hundreds of branches that help uncover restrictions at the level of cell types, brain regions, and gene expression cascades during differentiation. scGESTALT can be applied to other multicellular organisms to simultaneously characterize molecular identities and lineage histories of thousands of cells during development and disease. Cusanovich, Reddington, Garfield et al. The cis-regulatory dynamics of embryonic development at single-cell resolution. Nature (2018). Understanding how gene regulatory networks control the progressive restriction of cell fates is a long-standing challenge. Recent advances in measuring gene expression in single cells are providing new insights into lineage commitment. However, the regulatory events underlying these changes remain unclear. Here we investigate the dynamics of chromatin regulatory landscapes during embryogenesis at single-cell resolution. Using single-cell combinatorial indexing assay for transposase accessible chromatin with sequencing (sci-ATAC-seq), we profiled chromatin accessibility in over 20,000 single nuclei from fixed Drosophila melanogaster embryos spanning three landmark embryonic stages: 2-4 h after egg laying (predominantly stage 5 blastoderm nuclei), when each embryo comprises around 6,000 multipotent cells; 6-8 h after egg laying (predominantly stage 10-11), to capture a midpoint in embryonic development when major lineages in the mesoderm and ectoderm are specified; and 10-12 h after egg laying (predominantly stage 13), when each of the embryo's more than 20,000 cells are undergoing terminal differentiation. Our results show that there is spatial heterogeneity in the accessibility of the regulatory genome before gastrulation, a feature that aligns with future cell fate, and that nuclei can be temporally ordered along developmental trajectories. During mid-embryogenesis, tissue granularity emerges such that individual cell types can be inferred by their chromatin accessibility while maintaining a signature of their germ layer of origin. Analysis of the data reveals overlapping usage of regulatory elements between cells of the endoderm and non-myogenic mesoderm, suggesting a common developmental program that is reminiscent of the mesendoderm lineage in other species. We identify 30,075 distal regulatory elements that exhibit tissue-specific accessibility. We validated the germ-layer specificity of a subset of these predicted enhancers in transgenic embryos, achieving an accuracy of 90%. Overall, our results demonstrate the power of shotgun single-cell profiling of embryos to resolve dynamic changes in the chromatin landscape during development, and to uncover the cis-regulatory programs of metazoan germ layers and cell types. Cao, Packer et al. Comprehensive single-cell transcriptional profiling of a multicellular organism. Science (2017). 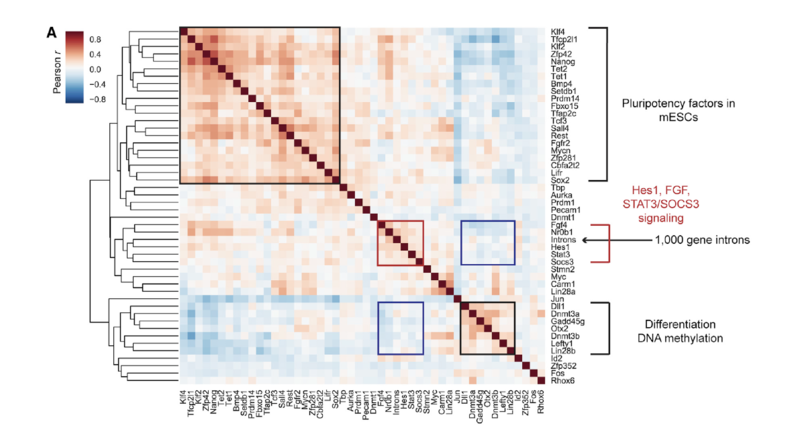 To resolve cellular heterogeneity, we developed a combinatorial indexing strategy to profile the transcriptomes of single cells or nuclei, termed sci-RNA-seq (single-cell combinatorial indexing RNA sequencing). We applied sci-RNA-seq to profile nearly 50,000 cells from the nematode Caenorhabditis elegans at the L2 larval stage, which provided >50-fold "shotgun" cellular coverage of its somatic cell composition. From these data, we defined consensus expression profiles for 27 cell types and recovered rare neuronal cell types corresponding to as few as one or two cells in the L2 worm. We integrated these profiles with whole-animal chromatin immunoprecipitation sequencing data to deconvolve the cell type-specific effects of transcription factors. The data generated by sci-RNA-seq constitute a powerful resource for nematode biology and foreshadow similar atlases for other organisms. Frieda, Linton, Hormoz et al. Synthetic recording and in situ readout of lineage information in single cells. Nature (2016). Reconstructing the lineage relationships and dynamic event histories of individual cells within their native spatial context is a long-standing challenge in biology. Many biological processes of interest occur in optically opaque or physically inaccessible contexts, necessitating approaches other than direct imaging. Here we describe a synthetic system that enables cells to record lineage information and event histories in the genome in a format that can be subsequently read out of single cells in situ. This system, termed memory by engineered mutagenesis with optical in situ readout (MEMOIR), is based on a set of barcoded recording elements termed scratchpads. The state of a given scratchpad can be irreversibly altered by CRISPR/Cas9-based targeted mutagenesis, and later read out in single cells through multiplexed single-molecule RNA fluorescence hybridization (smFISH). Using MEMOIR as a proof of principle, we engineered mouse embryonic stem cells to contain multiple scratchpads and other recording components. In these cells, scratchpads were altered in a progressive and stochastic fashion as the cells proliferated. Analysis of the final states of scratchpads in single cells in situ enabled reconstruction of lineage information from cell colonies. Combining analysis of endogenous gene expression with lineage reconstruction in the same cells further allowed inference of the dynamic rates at which embryonic stem cells switch between two gene expression states. Finally, using simulations, we show how parallel MEMOIR systems operating in the same cell could enable recording and readout of dynamic cellular event histories. MEMOIR thus provides a versatile platform for information recording and in situ, single-cell readout across diverse biological systems. McKenna, Findlay, Gagnon et al. 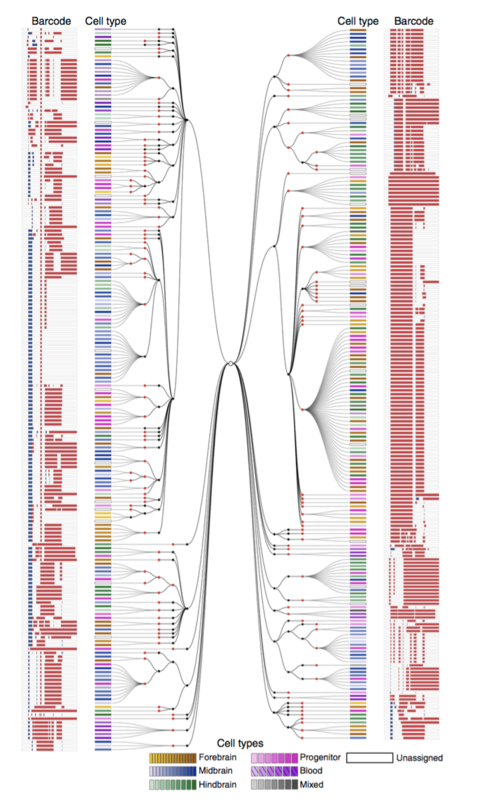 Whole-organism lineage tracing by combinatorial and cumulative gene editing. Science (2016). Multicellular systems develop from single cells through distinct lineages. However, current lineage-tracing approaches scale poorly to whole, complex organisms. Here, we use genome editing to progressively introduce and accumulate diverse mutations in a DNA barcode over multiple rounds of cell division. The barcode, an array of clustered regularly interspaced short palindromic repeats (CRISPR)/Cas9 target sites, marks cells and enables the elucidation of lineage relationships via the patterns of mutations shared between cells. In cell culture and zebrafish, we show that rates and patterns of editing are tunable and that thousands of lineage-informative barcode alleles can be generated. By sampling hundreds of thousands of cells from individual zebrafish, we find that most cells in adult organs derive from relatively few embryonic progenitors. In future analyses, genome editing of synthetic target arrays for lineage tracing (GESTALT) can be used to generate large-scale maps of cell lineage in multicellular systems for normal development and disease.